Pere, J., Pääkkönen, E., Ji, Y., and Retulainen, E. (2019). "Influence of the hemicellulose content on the fiber properties, strength, and formability of handsheets," BioRes. 14(1), 251-263. Hemicelluloses contribute to many intrinsic fiber properties, such as the swelling, fibrillation, bonding ability, and hornification tendency. During hornification, additional cross-linking between cellulose fibrils leads to a reduction in the swelling and water-holding capacity of pulp. The specific surface area, fibrillation, and flexibility of fibers also tend to decrease. To improve the plasticity of fibers and formability of the resulting paper, effective ways to control the fiber properties and their interactions in paper are highly desirable. 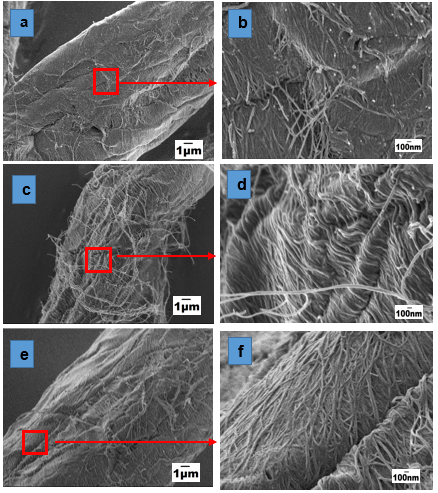 This work investigated the role of xylan in the plasticization of bleached birch pulp fibers, as hemicelluloses act as natural spacers and thus reduce the interfibrillar cross-linking. Controlled removal of hemicellulose from fiber cell walls was performed using alkaline extraction and enzymes. The results confirmed that the xylan content noticeably influenced fiber shape and sheet properties, such as the tensile strength, strain at break, density, and 2D formability. A 60% reduction in xylose content reduced the tensile index by approximately 65% and strain at break by 50% compared to the original sample. The reductions were proportional to the amount of xylan removed and could be attributed mainly to the reduced interfibre bonding. Cellulose, hemicellulose, and lignin are the three major chemical components of woody materials. The kraft pulping process is one of the most widely used methods in the world to produce pulp. During this process, lignin is removed from the wood to ensure the separation of cellulosic fibers from each other, and then a suitable pulp is produced for the desired paper products (Kocurek et al. 1989). Therefore, the main chemical components of kraft pulp are cellulose and hemicellulose. Although hemicellulose is much less abundant in pulp than cellulose, it plays an important role in fiber and paper properties (Leopold and McIntosh 1961; Pettersson and Rydholm 1961; Kettunen et al. 1982). The hemicellulose content and its molecular weight have been shown to affect the interfiber bonding and tensile strength of paper (Nordman 1958; Sjöberg et al. 2004; Danielsson and Lindström 2005). However, little information is available on the effects on the strain at break or formability of the paper produced. Köhnke et al. (2010) reported that changing the xylan content in the fiber could greatly affect the hornification properties of fibers, including the water retention value (WRV) and fiber saturation point (FSP). An alkaline extraction of bleached hardwood kraft pulp generated relatively pure xylan polymers and changed the pulp and paper properties, including the drainability and brightness stability (Fuhrmann and Krogerus 2009). Schönberg et al. (2001) reported that enzymes (xylanase) could break down the native xylan on the fiber surface, and the xylan content was shown to exert a major influence on the strength and related properties of the resulting paper. The microscopical study by Moss and Pere (2006) showed that the partial removal of xylan affected the collapse and swelling of bleached and unbleached birch kraft fibers during a drying and rewetting cycle. A considerable amount of research has evaluated the effect of the xylan content on fiber properties (Oksanen et al. 1997; Schönberg et al. 2001). Most of these studies were performed with low alkaline concentrations and thus only a small portion of xylan was removed. The ultimate goal of these studies was to find a way to extract xylan for the production of value-added chemicals without sacrificing the strength of the ultimate paper product. An improved understanding of correlations between the xylan removal and fiber, as well as the handsheet properties, is needed to further explore opportunities for additional revenue generation in the pulp and paper industry. In this study, a series of birch pulp samples with different xylan contents were produced by either alkaline treatment or enzymatic hydrolysis. Handsheets were produced from these pulps, and the strength, related mechanical properties, and extensibility were tested at VTT Technical Research Center (Jyväskylä, Finland). The objective of this project was to investigate the effects of the xylan content and xylan removal method on the structure of bleached hardwood fiber and the mechanical properties (such as strength, elongation and formability) of the prepared handsheet mechanical properties. An unbeaten never-dried bleached birch pulp sample was used as the raw material (UPM-Kymmene Oyj, Pietarsaari, Finland). Sodium hydroxide (analytical grade) was purchased from Sigma-Aldrich (Espoo, Finland). Trichoderma reesei xylanase II (pI 9) was produced and purified at VTT, as was described by Tenkanen et al. (1992). The xylanase activity of the purified xylanase II was measured using birch xylan as a substrate according to Bailey et al. (1992). The specific activity of the xylanase II was found to be 9700 nkat/mg. (1) Chemical extraction was performed with 1 M NaOH (4%) at 23 °C for 2 h under gentle mixing (315 rpm). Thereafter, the pulp was washed with distilled water until the filtrate pH reached 7.0 ± 0.5. Finally, the pulp was dewatered using a filter press. (2) Purified Trichoderma reesei xylanase II at a dosage of 2500 nkat/g was used for the enzymatic removal of xylan. Hydrolysis was performed under the following conditions: consistency of 5%, a pH of 5, and 45 °C for 24 h (short xylanase treatment 1, Xyl 1) and 72 h (longer xylanase treatment 2, Xyl 2). After enzymatic treatment, the pulps were washed with distilled water until the pH was 7.0 ± 0.5. The handsheets were prepared according to ISO 5269-2 (2004) standard. The handsheet samples were then dried and conditioned in a specific atmosphere according to ISO 187 (1990). The pulp compositions were analyzed by high pressure liquid chromatography (HPLC) according to TAPPI T249 cm-09 (2009). The molecular anionic charge (amount of carboxylic acids) was evaluated by titration according to SCAN-CM 65:02 (2002). The fiber analysis of various properties, such as the fiber length, shape factor, fines, kinks, etc., was conducted using a Kajaani FiberLabTM analyzer (Metso Automation Inc., Kajaani, Finland). The fiber shape factor is defined as the ratio of the distance between the fiber ends and the true contour fiber length (Zeng et al. 2012). The WRV values were determined according to SCAN-C 62:00 (2000). The FSP and pore size distribution (PSD) were measured as described by Maloney (2000). Fiber surface images were taken with scanning electron microscopy (SEM) (LEO DSM 982 Gemini FEG-SEM, Zeiss, Oberkochen, Germany). Immunolabelling imaging was done with a confocal microscope consisting of a Bio-Rad Radiance Plus confocal scanning system (Bio-Rad, Hemel Hempstead, UK) attached to a Nikon Eclipse E600 microscope (Nikon Corp., Tokyo, Japan). A red diode laser (637 nm) illuminated the samples. The physical properties of the obtained handsheets were measured according to ISO standards. The basis weight/grammage, thickness, and density were determined based on ISO 534 (2011) and ISO 536 (2012). The tensile strength, strain at break, and tensile stiffness were measured according to ISO 1924-2 (2008). The formability was tested using a tailor-made 2D formability tester (VTT Technical Research Centre of Finland, Jyväskylä, Finland) at 60 °C using 20-mm wide strips as described by Vishtal and Retulainen (2014). The chemical compositions of the pulp samples (initial and treated) are shown in Table 1. 1 MeGlcA means “Methylglucuronic Acid”, 2 GalA means “Galacturonic Acid”. The data presented in Table 1 showed that approximately 58% of the original xylan was removed during the NaOH treatment, while 31% and 42% of the xylan was removed during the Xyl 1 and Xyl 2 treatments, respectively. The NaOH treatment was more efficient in terms of the xylan removal, and the xylose to glucose ratio was the smallest among the three treatment conditions. The NaOH treatment was less selective than the enzyme-catalyzed process. The acidic groups present in xylan are the main components responsible for the fibers’ anionic charge, which probably also contributes to the fiber swelling. During the xylanase treatments, the acidic groups contents were decreased along with the xylan content in the Xyl 1 and Xyl 2 treatments. However, after the extended xylanase treatment (Xyl 2), the fibers still possessed the same charge, 20 mmol/kg to 21 mmol/kg, as after the alkaline treatment, even though the NaOH treatment removed more xylan than the Xyl 2 treatment. This phenomenon may have been because of degradation reactions occurring during the NaOH treatment, which could form some acidic groups. Knill and Kennedy (2003) showed that during cellulose degradation under alkaline conditions, many different acidic groups were detected in the degradation products of the cellulose, cellobiose, and glucose. The occurrence of cellulose degradation was confirmed by gel permeation chromatography (GPC), as explained below in the corresponding section. The WRV of the xylanase-treated fibers was higher than that of both the NaOH-treated and original pulp fibers. However, the WRV remained constant regardless of the xylanase loading and treatment time. Surprisingly, the NaOH-treated fibers had a lower WRV than the original pulp fibers. This was probably because of the changes in the capillary structure of the fibers during the NaOH treatment. The anionic charge is unlikely to be a factor that can affect the WRV because the NaOH and Xyl 2 treatments yielded similar anionic charge values (see the corresponding data in Table 1). The alkaline treatment is more aggressive than the enzymatic treatment; hence, it opened the outer cell wall structure of the pulp fiber, which led to an easier removal of water during centrifugation. Gomes et al. (2014) treated eucalyptus kraft pulp with 10 to 70 g/L NaOH and also found that the water retention value decreased with the decrease of the xylan content. This hypothesis was corroborated by the corresponding SEM images. The FSP value is considered to be a more accurate indicator than the WRV to estimate the amount of water inside of the cell walls (within interlamellar macropores), which are built up during delignification (Maloney 2000). After the xylan extraction from the fibers, the volume of the macropores increased. However, the FSP measurement does not include water in such pores that are larger than the dextran probe (approximately 54 nm). The data presented in Table 1 show that the original pulp fibers had the highest FSP value. The NaOH treatment decreased the FSP value more noticeably than the xylanase treatments. The difference between the original pulp fibers and xylanase-treated fibers was probably because of the lower amount of xylan present in the latter, which was in agreement with the findings of Maloney et al. (1998). The NaOH treatment decreased the xylan content considerably and loosened the outer surface of the fiber cell wall, which lowered the FSP value. The pore size distribution (PSD) results are shown in Fig. 1. The PSD value relates to cell wall micropores, which are formed as a result of the dissolution of hemicelluloses and lignin during delignification (Maloney 2000). A slight decrease in the cumulative pore volume was observed for all of the treated pulp fibers compared with the original pulp. This observation was consistent with earlier findings that the microporous volume decreased as the pulping yield decreased below 70% (Maloney and Paulapuro 1999). The molar mass distributions of the different pulp fibers are shown in Fig. 2. The GPC chromatograms confirmed that xylan was removed by both the NaOH and enzymatic treatments, as the peak areas of the molecular weight (MW) in the region of 10,000 to 20,000 decreased. The NaOH treatment resulted in the highest removal of xylan, which indicated the removal of various xylan fragments (with different degree of polymerization values). 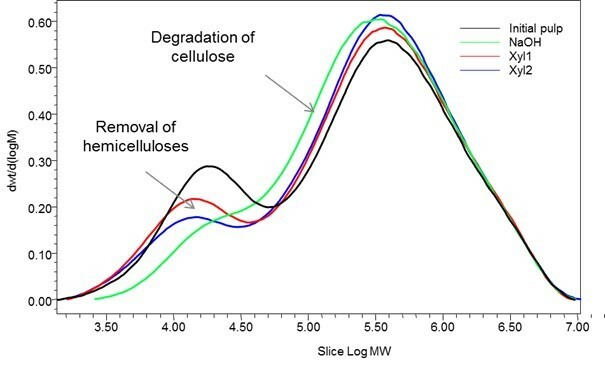 A slight degradation of the cellulose was also observed with the NaOH treatment, as the highest peak (MW = 250,000 to 500,000) was shifted to the left (shown by the green line in Fig. 2). The high molecular weight fraction of the cellulose remained unaffected (MW > 1,000,000). In contrast, no cellulose degradation was observed for the xylanase treatment because of the selectivity in the hydrolytic action of the xylanase on the pulp fibers. Accordingly, the xylan molar mass was only slightly decreased in the xylanase-treated samples. The height of the hemicellulose peak decreased correspondingly, and this effect was more pronounced for the Xyl 2 treatment. Figure 3a shows that the NaOH treatment extensively decreased the average fiber length and shape factor compared with both the xylanase-treated fibers (Xyl 1 and Xyl 2) and original pulp. Figure 3b shows that the removal of xylan was accompanied by changes to the fiber shape. The shape factor decreased and the number of kinks in the fibers increased. The shape factor was the lowest for the NaOH-treated pulp fibers, which was further confirmed by the microscopic studies, which is discussed in the next section. Figure 4 shows the microscope images of the different fibers. It was obvious that the NaOH-treated fibers (Fig. 4b) had more fines and a higher kink index than the xylanase-treated fibers (Figs. 4c and 4d), which agreed with the results that are shown in Fig. 3. The pulp samples were further characterized by high resolution SEM (Fig. 5). The alkaline treatment was expected to extensively affect the fiber surface morphology. Figures 5c and 5d suggest that the fibers were rugged and heavily fibrillated. They appeared soft and “fluffy”, and the cell wall structure was opened and loosened by the NaOH treatment. Fig. 4. 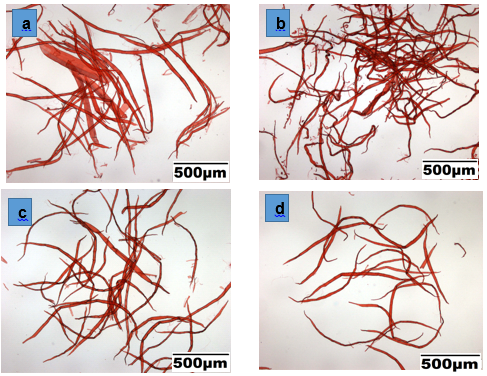 Light microscope images of the pulps: (a) initial pulp, (b) NaOH treatment, (c) Xyl 1 treatment, and (d) Xyl 2 treatment; fibers were stained with 1% Congo red. Similar behavior was observed on soda bagasse pulp with different amounts of xylan contents (Djafari Petroudy et al. 2015). Therefore, removal of xylan can positively affect the fibrillation of the pulp fibers. However, the fiber walls appeared compact, the cell wall fibril structure was more visible, and no external fibrillation was observed for the enzyme-treated samples (Figs. 5e and 5d). The untreated original fibers were also compact and smooth, and the surface fibril structure was poorly visible in some parts of the fiber (Figs. 5a and 5b). Semi-quantitative immunolabelling experiments were performed to confirm the decrease in the surface xylan contents. For this purpose, the fibers were labelled with specific antibodies and visualized after staining with a fluorescent reagent. Figure 6 clearly shows that the alkaline and xylanase treatments reduced the xylan content in the fibers. The xylan moiety was shown as bright patches and spots along the fiber surface in the original pulp. In the untreated initial pulp, some differences in the labelling intensity between individual fibers were observed. The bright red arrows in Fig. 6 indicate the deformed and less ordered areas of the fibers, such as dislocations, that were more accessible to the labelling agent. In contrast, in the NaOH- and xylanase-treated samples, the fibers appeared merely faintly labelled along the fiber surface, which indicated the occurrence of some residual sub-surface xylan units (Figs. 6e and 6f). No remarkable difference was observed between the two treatment methods (Figs. 6e and 6f). Fig. 5. 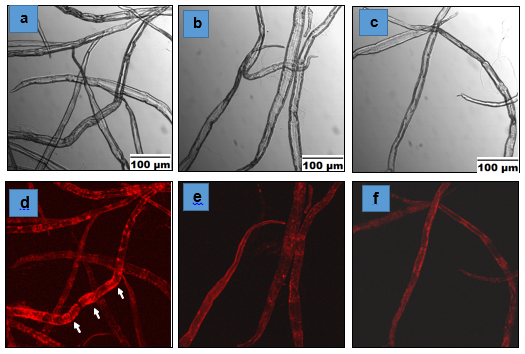 High resolution images of the initial pulp (a and b), alkaline-treated fibers (c and d), and Xyl 2-treated fibers (e and f). Handsheets were prepared from the treated fibers and tested in a standard-conditioned paper lab at VTT Technical Research Center. The results are shown in Figs. 7a to 7d. The density of the sheets decreased with the removal of xylan, and the lowest density value was obtained for the NaOH-treated sample (Fig. 7a). The tensile index of the NaOH-treated pulp fiber decreased by approximately 65% compared with that of the original sample, while the tensile index of the xylanase-treated samples decreased by 30% and 40% for the Xyl 1 and Xyl 2 treatments, respectively (Fig. 7b). This was probably because the NaOH treatment removed the most xylan of all of the treatments (Table 1), which reduced the fiber conformability and bonding ability. The NaOH treatment also degraded some cellulose, as was indicated by a lower molar mass and lower fiber length (Figs. 2 and 3a). 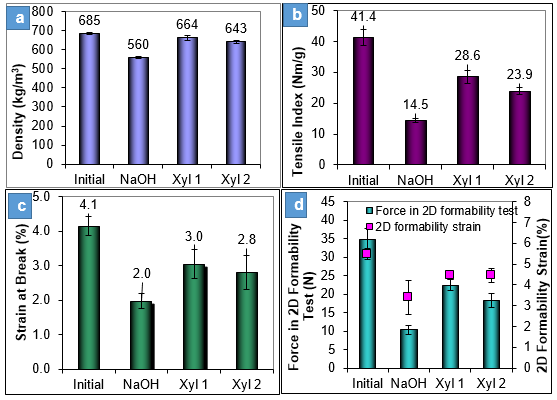 Figures 7c and 7d show that the removal of xylan decreased the strain at break and 2D formability strain of the handsheets prepared from the treated fibers. It has also been suggested that removal of hemicelluloses alters the supramolecular structure of the cellulose in the fiber wall, increase the cellulose microfibril aggregation and lead to a decrease in tear index of the handsheet at a specified tensile index (Larsson and Salmén, 2014). The NaOH treatment led to the lowest strain at break and 2D formability values. Fig. 6. Immunolabelling of the surface xylan in the initial pulp (a and d), NaOH-treated (b and e), and xylanase-treated (c and f) samples. The upper images show fibers illuminated in a bright field. The lower images show the same fibers under a red diode laser (637 nm). The arrows indicate strong labelling within the deformed fiber areas. The correlations between the measured strain at break and tensile index vs. the xylose content of the pulps are shown in Fig. 8. The values of the strain at break and tensile index decreased as the xylan content in the fiber decreased. The reduction in tensile index was relatively more affected. A 60% reduction in xylose content due NaOH treatment reduced the tensile index by approximately 65% and strain at break by 50% compared to the original sample. The xylanase treatment removed less xylan, but the reductions in tensile strength and strain at break were generally almost proportional to the xylan content. Figure 8b shows the inter-relationship between the tensile index and strain at break values of the pulps with different xylan contents. The tensile index correlated linearly with the strain at break (R2 = 0.9968), which showed that the removal of xylan led to an earlier failure of the sheet probably due to reduced inter-fiber bonding, and partly due to increased fiber curl. Köhnke et al. (2008) investigated the adsorption of (glucurono)arabinoxylan (GAX) on industrially produced never-dried Scandinavian softwood pulp and also found that xylan amount could affect the tensile strength due to a improved fiber-fiber bonding ability. Miletzky et al. (2015a) showed explicitly that the strength of individual bonds between softwood kraft pulp fibers was improved by adsorption of xylan. However, Miletzky et al. (2015b) observed no significant impact on strength properties of handsheets. This was probably due to the heterogeneous distribution of xylan on the fiber surfaces. Based on the experimental results and comparison with literature it could be concluded that considering the reduced sheet density after xylan removal, the reduced anionic charge and FSP the xylan removal not only resulted in a lower fiber flexibility and surface conformability in the wet state and lower number of fiber bonds, but also resulted in weaker bonds. The xylan content in the pulp fibers probably also had an effect on the supramolecular arrangement and interfibrillar hydrogen bonding in the fiber wall, but that effect could not be directly confirmed. The alkaline treatment reduced the fiber swelling of the bleached never-dried birch kraft pulp and produced fibers having an increased number of kinks, reduced shape factor, decreased anionic character, and gave more fibrillated cell wall structures compared with the fibers treated with xylanase. The alkaline extraction was less selective during xylan removal than the xylanase treatments because of its tendency to degrade cellulose. The xylanase treatments were more selective and gentle, and they removed xylan while maintaining the fiber swelling. A 60% reduction in xylose content due NaOH treatment reduced the tensile index by approximately 65% and strain at break by 50% compared to the original sample. Xylanase removed less xylan and had smaller effects. However, the measured reductions were nearly proportional to the amount of xylan removed. The tensile index correlated linearly with the strain at break (R2 = 0.9968) which together with the decrease in sheet density indicated that the removal of xylan reduced the inter-fiber bonding, i.e. number of bonds and strength of individual bonds. This research project was funded by Finnish Bioeconomy Cluster Ltd. (Fubio program) and the Academy of Finland (Grant No. 285627). The authors would like to thank the Fulbright Center of Finland for their support of Associate Professor Yun Ji. The authors would also like to acknowledge Professor Evguenii Kozliak at the University of North Dakota for his excellent comments on this manuscript. Bailey, M. J., Biely, P., and Poutanen, K. (1992). “Interlaboratory testing of methods for assay of xylanase activity,” J. Biotechnol. 23(3), 257-270. Fuhrmann, A., and Krogerus, B. (2009). “Xylan from bleached hardwood pulp – New opportunities,” in: TAPPI Engineering, Pulping and Environmental Conference 2009, Memphis, TN, pp. 2668–2701. ISO 187 (1990). “Paper, board and pulps – Standard atmosphere for conditioning and testing and precedure for monitoring the atmosphere and conditioning of samples,” International Organization for Standardization, Geneva, Switzerland. ISO 1924-2 (2008). “Paper and board – Determination of tensile properties – Part 2: Constant rate of elongation methods (20 mm/min),” International Organization for Standardization, Geneva, Switzerland. ISO 5269-2 (2004). “Pulps – Preparation of laboratory sheets for physical testing – Part 2: Rapid Köthen method,” International Organization for Standardization, Geneva, Switzerland. ISO 534 (2011). “Paper and board – Determination of thickness, density and specific volume,” International Organization for Standardization, Geneva, Switzerland. ISO 536 (2012). “Paper and board – Determination of grammage,” International Organization for Standardization, Geneva, Switzerland. Kettunen, J., Laine, J. E., Yrjälä, I., and Virkola, N.-E. (1982). “Aspects of strength development in fibres produced by different pulping methods,” Pap. Puu-Pap. Tim. 64(4), 205-211. Kocurek, M. J., Grace, T. M., and Malcolm, E. (1989). Pulp and Paper Manufacture: Alkaline Pulping, TAPPI Press, Atlanta, GA.
Leopold, B., and McIntosh, D. C. (1961). “Chemical composition and physical properties of wood fibers. III. Tensile strength of individual fibers from alkali extracted loblolly pine holocellulose,” TAPPI J. 44(3), 235-240. Maloney, T. C. (2000). On the Pore Structure and Dewatering Properties of the Pulp Fiber Cell Wall, Finnish Academy of Technology, Helsinki, Finalnd. Maloney, T. C., and Paulapuro, H. (1999). “The formation of pores in the cell wall,” J. Pulp Pap. Sci. 25(12), 430-436. Maloney, T. C., Todorovic, A., and Paulapuro, H. (1998). “The effect of fiber swelling on press dewatering,” Nord. Pulp Pap. Res. J. 13(4), 285-291. Nordman, L. S. (1958). “Bonding in paper sheets,” in: Fundamentals of Papermaking Fibres: Transactions of the Symposium, Cambridge, UK, pp. 333-347. Pettersson, S. E., and Rydholm, S. A. (1961). “Hemicelluloses and paper properties of birch pulps. Part 3,” Sven. Papperstidn. 64(1), 4-17. SCAN-C 62:00 (2000). “Chemical pulp – Water retention value,” Scandinavian Pulp, Paper and Board, Stockholm, Sweden. SCAN-CM 65:02 (2002). “Pulp – Total acidic group content: Conductometric titration method,” Scandinavian Pulp, Paper and Board, Stockholm, Sweden. TAPPI T249 cm-09 (2009). “Carbohydrate composition of extractive-free wood and wood pulp by gas-liquid chromatography,” TAPPI Press, Atlanta, GA. Article submitted: June 29, 2018; Peer review completed: September 23, 2018; Revised version received and accepted: November 8, 2018; Published: November 16, 2018.